Department of Homeland Security Secretary Kirstjen Nielsen will visit Imperial County to meet with DHS employees and tour construction of the Calexico border wall system. 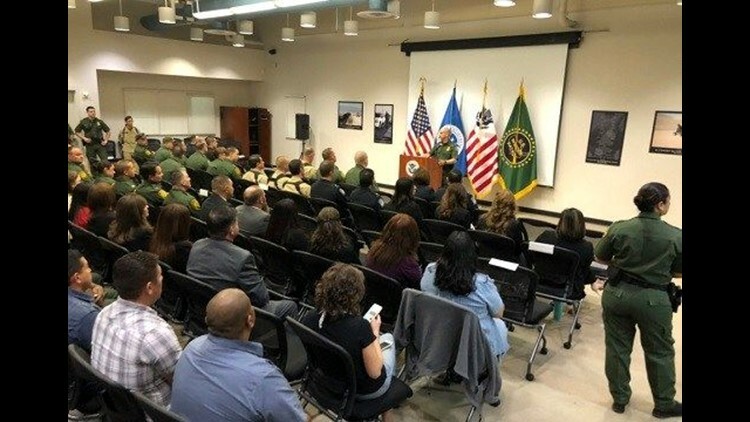 SAN DIEGO (NEWS 8) - Department of Homeland Security Secretary Kirstjen Nielsen met with DHS employees in Imperial County and took a tour of the Calexico border wall construction Wednesday. Nielsen traveled to Calexico to see what’s new with the building of the border wall system there and she also wanted to personally thank the Department of Homeland Security workers for their commitment to securing our borders. Nielsen listened to challenges that DHS workers face on the frontline. Governor Jerry Brown says California's National Guard troops are ready to help combat drug and gun smuggling and human trafficking from Mexico. The governor says he is close to an agreement with the Trump administration to send National Guard troops to the border. His comments come a day after federal officials said California rejected some proposed duties for the guard. Governor Brown pledged 400 troops last week, on the condition that they have nothing to do with immigration enforcement. "There are enough problems at the border and the interface between our countries that California will have plenty to do." Gov. Jerry Brown said. President Donald Trump tweeted Wednesday morning that Gov. Brown is "trying to back out of the National Guard at the Border, but the people of the State are not happy. Want Security & Safety NOW!" The County Board of Supervisors Tuesday voted to file a court brief siding with the federal government against the sanctuary state law.